Those concerned with the current eco-crisis most often look only to scientists and politicians for solutions. In this important book, Patricia Cori invites another, overlooked group--perhaps the most important one--to join the discussion. 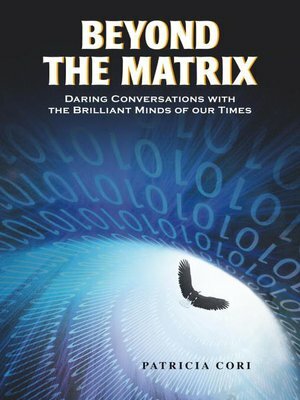 Beyond the Matrix collects some of the most provocative, forward-thinking interviews conducted on Cori's radio show of the same name, bringing together leaders in various fields of alternative thinking to propose new and exciting perspectives on the future of humanity as we approach the potentially life-changing 2012. Beyond the Matrix offers a portrait of a refreshingly optimistic future in a time when we are bombarded with an apocalypse scenario as the future of our civilization. The book features no-holds-barred, in-depth interviews with such renowned thinkers as New York Times best-selling author and theoretical physicist Michio Kaku, whom many call the Einstein of our times; respected UFO and ET investigator Stanton Friedman; radical Egyptologist Stephen Mehler; former astronaut and the sixth man on the moon Dr. Edgar Mitchell; crop circle expert Andy Thomas; intuitive physicist MaAnna Stephensen; Paradigm Research Group director Stephen Bassett; founder of bluevoice.org Hardy Jones; and nine others. The probing conversations cover a bracing range of subjects, from string theory, UFO and extraterrestrial life, crop circles, and ecology to healing, Egyptian mysticism, ascension, and other significant topics that swirl in our minds as we face a new paradigm for human exploration, where spirit and science finally merge. With its blend of fascinating dialogue and higher ideals, Beyond the Matrix offers both hope and reassurance in these challenging times.